I was out photographing the floods again today but I thought I’d ring the changes here with a shot from last Friday. Traffic light trails around Seven Dials in Covent Garden, London. PS For those who were curious after my post yesterday, I told her it would be better if she learned to take pictures with the camera she had, showed her the HDR button on her iPhone and invited her to join my camera club! 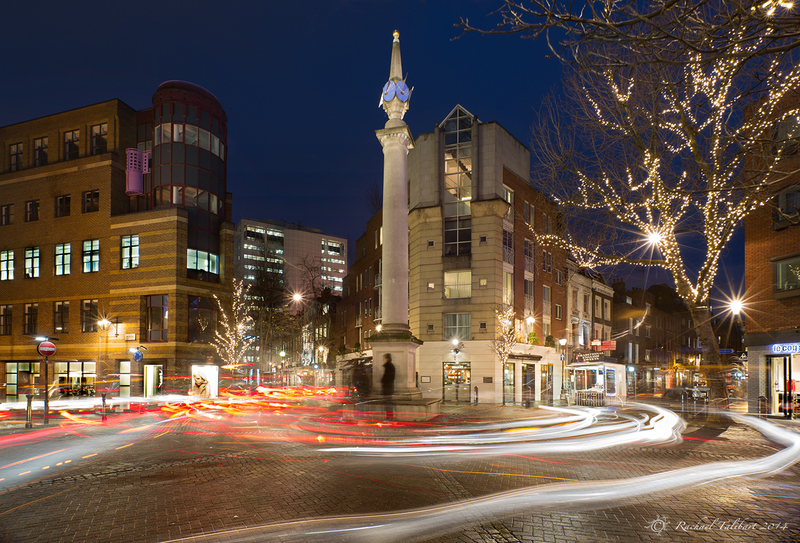 This entry was posted in photography and tagged city, Covent Garden, light trails, London, long exposure, photograph, photography, Seven Dials by Rachael. Bookmark the permalink. Such a kind thought! Often in life you wish to do something but have no clue how to. If she was really interested in photography now she knows how to go about it. Going in circles?….. also another fantastic shot! Great answer! I do hope she joins, I bet she’d learn lots! You are more thoughtful than I might have been with your answer. What a terrific idea, inviting her to learn more with what she already has. I love your long exposures. Fab…light trails, starbursts and Covent Garden. What more could one need? Very pretty! Amazing starbursts from the lights there too.